A coating of snow might look nice in the winter, but you won’t find many that look forward to tasks like removing snow from driveways and walkways. It’s hard work that can be time-consuming, especially if you don’t know how to remove snow properly. Not only that, but snow removal also comes with the risk of injury. If you want to save yourself some time and effort, following the right snow removal tips can help. However, your choice of snow removal equipment can make an even bigger difference. In this post, we are going to look at how to remove snow with a surprising variety of tools, including a snow blower, leaf blower, snow rake, seed spreader, Aerocart wheelbarrow/snow plow, and shovels. This first snow removal tool might not come as a surprise to some readers, but it has to be mentioned simply because it’s so good at what it does. Snow blowers can be great for clearing large driveways and they will reduce the work and the amount time it takes to get the job done. You can even select from electric or cordless snow blowers, which happen to be much easier to operate and maintain than gas-powered models. Best of all, you don’t need to be an expert on how to remove snow when you have one of these in your toolshed. A good snow blower will take care of much of the work. A leaf blower is another summer tool that can be used for winter yard care. Using a leaf blower for snow removal can be a good way to clear a driveway or a walkway. A tool like the TURBINE 40V Cordless Leaf Blower can be the perfect addition to your snow removal equipment. It’s cordless, so you don’t need to run a cord through the snow, and the 40V battery will provide plenty of runtime as you remove snow. If you own a seed spreader for maintaining your lawn, it can be used as a part of your winter yard care routine. All you need to do is fill your seed spreader with some salt. Then, this snow removal tool can be used to quickly and easily deice driveways, walkways, and sidewalks. Snow removal isn’t just a job for driveways and walkways; in some cases, you might need to remove snow from your roof. A snow rake is the ideal snow removal tool for clearing a roof. If you’re wondering how to remove snow with this type of tool, it’s actually quite simple. You simply move it back and forth across your roof to encourage the snow to fall. And, thanks to the long handle, you can do the job from the safety of solid ground. This piece of snow removal equipment can even help to prevent the roof damage associated with ice dams. By removing snow before it can melt from the heat of your home, you’ll avoid these heavy and potentially harmful structures. Shoveling a driveway is a lot of work, but there are specialized shovels that can make it a little easier. Push shovels, for example, are a type of snow shovel designed to work like a snowplow. The user can push it down the path and the push shovel clears the snow as you work your way forward. Some come with wheels to make the work easier and some even have handles you can use to lift the snow. The Aerocart 8-in-1 Wheelbarrow is already one of the most versatile yard tools available, but when you add some of the attachments, it gets even more useful. With the Aerocart Wheelbarrow snow plow attachment, you can turn this lightweight wheelbarrow into an easy-to-use snow removal tool. The snow plow attaches easily to the Aerocart and will save you a lot time and hard work when you need to clear snow. A snow blower can be a useful piece of snow removal equipment, but it might be bit much for some properties. If you want to take some of the work out of snow removal but think a snow blower is too much for your home, you might want to consider a power shovel. These snow removal tools work in a way that is similar to a snow blower, but they are smaller and narrower. You might not be able to avoid snow removal altogether, but there is no reason to do the work the hard way. With the right snow removal equipment, you can limit the amount of time you have to spend out in the cold and you can also limit the strain on your back. 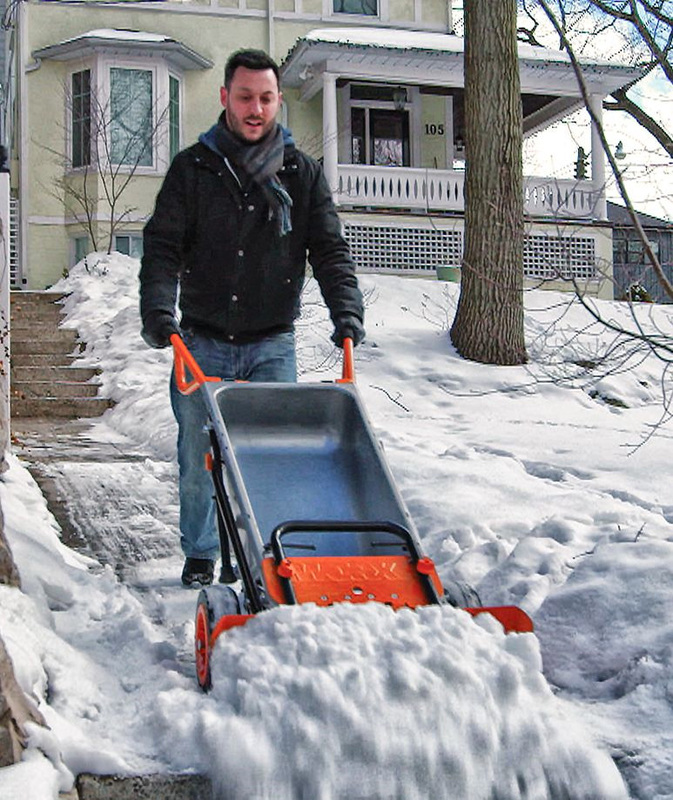 Take the hassle out of clearing snow with effective snow removal tools from WORX! Learn how to remove snow with a surprising variety of tools, including a snow blower, leaf blower, snow rake, seed spreader, Aerocart wheelbarrow/snow plow, and shovels.